SAMARA, Russia (AP) Joseph Stalin’s secret bunker has become the unlikely meeting point for thousands of fans who have descended on the Russian city of Samara during the World Cup. Emerging from the underground shelter more than 120 feet (37 meters) below, Mexicans donning traditional sombreros and Colombians and Uruguayans carrying national flags were fascinated with this remnant of Soviet history that remained unknown for 50 years. ”It’s amazing to see so many Latin Americans gathered here. Soviet history is so foreign to us, and getting to know this part of history, which is new to us, is so cool,” said Edly Mortera, a Mexico fan wearing the green shirt of the national team. Her husband, Edgard Ramirez, surfaced from the bunker with a wide-brimmed embroidered sombrero in his hand, and some local residents asked him if they could take pictures. Stalin’s bunker was built in Samara in 1942. The city, which during Soviet times was known as Kuibyshev, became a strategic point during World War II because it was far from the conflict and it provided an escape route through the Volga River. Many of the government’s offices were transferred to Samara when Moscow was under the threat of a German attack and Stalin became the main target of the Nazis. For more than half a century, the bunker that could shelter about 100 people remained one of the world’s best-kept secrets. Few could imagine that in a nondescript common alley there was a house with an underground passage with a depth equivalent to a 12-story building. 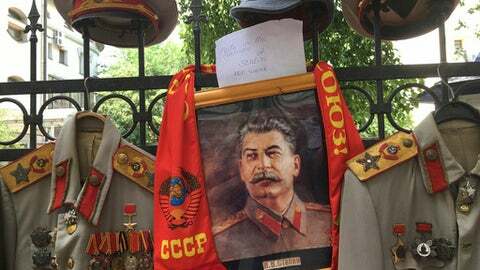 On a recent day, dozens of tourists lined up outside the fortress, while a local resident offered photo opportunities with rented replicas of Stalin military uniforms adorned with Soviet hammer and sickle medals. Some visitors sat nearby on a bench exhausted by the heat and tried to guard themselves from the scorching sun using traditional Colombian woven hats or Uruguayan flags tied around their necks like capes. As they walked in, they were greeted by an imposing stained glass window with an image of Stalin, who ruled the Soviet Union with an iron fist from 1924 until his death in 1953. Communists and other hardliners credit him with leading the country to victory in World War II and making it a nuclear superpower, while others condemn the brutal purges that killed millions. There is no written proof that Stalin ever made it to the bunker. But his bed of white linens is still in a room under a curved pink roof. Just a few steps away is his office, with a green lamp and an old rotary phone on top of a dark wooden desk. An emergency meeting room with a large table reserved for the national defense committee is decorated with images of Karl Marx, Friedrich Engels and Vladimir Lenin. ”I was really impressed by the way that it was built,” Daniel Astesiano, an Uruguay fan who wore his team’s sky-blue shirt, said deep inside the bunker.